Special Containment Procedures: SCP-4837 is kept in an avian observation deck at Site-64. In the event of a containment breach, recovery agents are to locate SCP-4837 and offer to engage in a trade in exchange for its return to containment. Description: SCP-4837 is a European Mallard (Anas platyrhynchos) capable of accessing an extra-dimensional space. SCP-4837 uses this space to store and retrieve objects for trading with human customers. Typically, it will initiate the trade by telepathically communicating with the desired customer, manifesting as a refined English accented voice using archaic speech. After it has received the desired item, it will move away from the exchange and conceal itself from possible witnesses, returning moments later with another item. Attempts to observe this process have been met with insistence from SCP-4837 that it cannot perform the action while in view. SCP-4837 has displayed a particular interest in electronics and relevant technology such as smartphones, cameras, televisions, and microwaves. This is in contrast to objects from SCP-4837, all of which have been dated to 600-1100 A.D.1 Although there are 74 items received by SCP-4837 currently cataloged, the exact quantity of its hoard is unknown. The following interview was conducted with SCP-4837 three days after capture. SCP-4837 agreed to the interview in exchange for a Google Pixel smartphone. Foreword: Dr. Hintze was instructed to write down all responses from SCP-4837 during the interview. Improper grammar has been preserved for accuracy. Dr. Hintze: Can you tell me where exactly you create your goods? SCP-4837: I shall not concede to thine questions! Thou shalt know only of the wrath of Espoderick! Behold and despair, jailer! Dr. Hintze: (sighs) I know you made an agreement with Dr. Mathias to consent to an interview, so I'm afraid that isn't going to work. Please answer the question, SCP-4837. SCP-4837: … A curse shall be laid upon Mathias for such treason. Very well, then. I hath a collection. A mighty collection. Dr. Hintze: Thank you. Now, where is the collection? SCP-4837: I will not show it to thee. I will not relinquish my riches to thee, worm! SCP-4837: Never! Doth thou comprehend?! Never! Dr. Hintze: Alright, alright. If you can't tell me where, can you tell me why? SCP-4837: Many years ago, I had great interest. Sharp swords, big bludgeons. Adventure. Power! Alas, the times have changed. No more is it an era of kings, and no longer are mine gains of worth. So, it must all go and I shalt keep up with the times. Dr. Hintze: If you want to give away all of your things, why not leave it all somewhere? SCP-4837: Thou does not know of ancient binds? How very simple. All scholars know that my kind is bound by ancient laws. Such things prevent me from leaving my wealth in another's hands. No, only trade will suffice. Dr. Hintze: How old are you? SCP-4837: Older than thou can comprehend, simpleton. SCP-4837 walks away from Dr. Hintze. Dr. Hintze: Just a moment, SCP-4837. We're not done here. SCP-4837: I hath no more will to answer questions. Leave me be. Dr. Hintze pulls out a pair of wireless earphones from his coat pocket. SCP-4837: … Thou wishes to trade? Dr. Hintze: Bluetooth earphones to extend our chat. SCP-4837: I permit one more question. SCP-4837: Thine greed is one to rival my own, it seems… I permit two questions. Dr. Hintze places the earphones on the ground. SCP-4837 picks them up in his beak and flings them around his neck. Dr. Hintze: Are you satisfied now, SCP-4837? SCP-4837: For this moment, I am. Thou may ask two more questions. Dr. Hintze: Perfect. So, if you don't know your own age, let's discuss your possessions. Is there a reason you collected things from this period? SCP-4837: 'Twas the age of adventure! Knights and vagabonds alike sought out my immense wealth, and I struck them all down! Their arms serve as my trophies in the wake of their death! … Alas, these spoils of war no longer bring me joy. Shame, really. Many squires are dead and I'm now bored of it. Dr. Hintze: Excuse me, but I fail to see how a man with a sword could lose to a duck. SCP-4837: Ah, thou would like to test thy might? Thou doth believe they are mightier than a "duck"? Dr. Hintze: … Not particularly. SCP-4837: A-ha! Thou realizes thine folly. Perhaps thou truly is a scholar after all. Dr. Hintze: More importantly, why are you bored with what you have? Some of these items have been appraised for a sizable amount. SCP-4837: Though my collection is grand, it has diminished in function. Those like myself have far more impressive treasures. I seek to overcome them. Many would weep at the sight of the Google Pixel! Dr. Hintze: You mean ducks? SCP-4837 is silent for a moment. 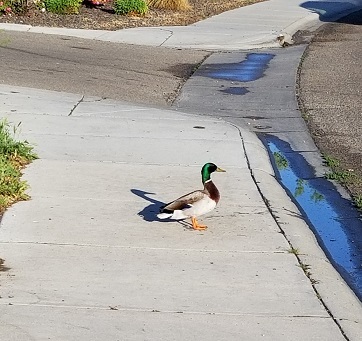 SCP-4837: Heed this warning, scholar: Thou wilt call me "duck" no longer. Once I am free of this feathered form, once I am freed of this prison thine scholar's circle has trapped me within, both thou and that damned wizard will know my true strength.